Quick Summary. FBR have a petition to support Air France who continue to be one of the few airlines willing to transport primates for research. Please support them by signing the petition. The pressures on primate researchers have taken many forms. In the United States, for example, commercial airlines have effectively ceased all primate shipments by air within the country, making it difficult for researchers to transport animals. Many airlines in Europe have taken similar steps, but Air France continues to provide service. In March, China Southern Airlines announced it would cease transporting primates. This leaves Air France as one of the few international airlines that continue to transport animals. Air France Cargo refuses transportation if the testing protocols do not conform to these regulations and visits all customers to make sure this is the case. Air France Cargo also monitors the supplier, who must comply with the breeding rules in force. The European Directive 86/609 from 8 September 2010 states that “the use of live animals remains necessary to protect human and animal health and the environment.” In particular, “the use of nonhuman primates in scientific procedures is necessary for biomedical research”. 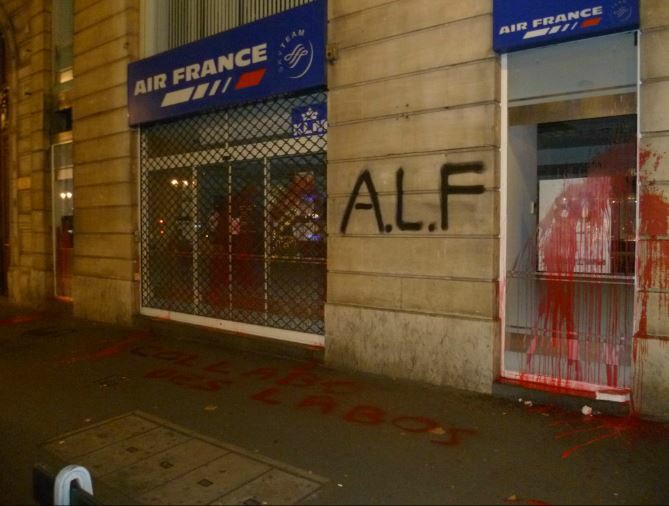 Nonetheless, the Airline continue to suffer protests and illegal activity from animal rights activists.The Biteback website, which details illegal activities by the ALF, mentions several offices vandalised in March 2014 and December 2013. The Foundation for Biomedical Research has produced a petition to support Air France. The petition reads as follows. I am signing this petition to commend Air France for its valiant commitment to transporting laboratory animals for biomedical research. While many airlines have acquiesced to animal rights groups’ demands to end the shipment of lab animals, Air France has remained steadfast in its support of the scientific community. Scientific and medical research with animal models is essential for the discovery of cures, treatments and therapies for diseases affecting both people and animals. While the majority of this research is conducted with rodents that are bred specifically for research, other animal models are essential to study specific diseases because of their biological and physiological makeup. Because of the genetic similarities they share with people, nonhuman primates play an invaluable role in the study of devastating diseases like Alzheimer’s, Parkinson’s, HIV/AIDS and malaria, which affects 26 million, 7.4 million, 34 million and 216 million people respectively worldwide. In the study of these four diseases alone, 283 million people’s lives depend on the lifesaving research that scientists are currently conducting with the help of nonhuman primates. Ending the commercial shipment of nonhuman primates will stall vital biomedical research projects that are currently underway and increase costs for scientists and institutions that are conducting this time-sensitive research. Funds that could be invested in lifesaving research projects will be diverted to charter private flights for these animals. Safe, reliable air transportation is an essential element of medical and scientific advancements across the globe. When research animals are not available to research centers, R&D projects are suspended or discontinued, leading to significant delays in the development of new treatments to improve human health. I am most grateful that Air France has stood firm in its commitment to continue the shipment of lab animals and for standing with the biomedical research community in the fight against disease. Thank you for standing up for research and saving human and animal lives. FBR note that due to the high traffic of the petition, some people are receiving error messages, but they should be assured that their responses have been received. So please sign the petition today and show your support for Air France as they bravely stand against animal rights extremism.